In a world where people worship everything and value nothing, I have found that I value the many messages present within La La Land (2016). While simultaneously shining a harsh light on the hypocrisy of Hollywood and showing how our dreams and passions move us to make tough life decisions, I found myself deeply moved by the narrative presented within this film, not only as a lover of movies but as a creative artist myself. This film is for the dreamers. It’s for the people who never give up in pursuing what they want out of life. It’s for those who have a talent screaming to be noticed by others. Aside from literally being the best musical I’ve seen in nearly more than a decade (Chicago (2002) is the only recent one that comes to mind), what I found most impressive about this film is that it is only the second directed by Damien Chazelle. For those who may have missed it, his previous work, Whiplash (2014), was an extreme look at the commitment a musician will take just to be a part of something bigger. With this in mind, we find that Chazelle has a passion for music that is easily grasped through his use of expert cinematography. Much like The Young Girls of Rochefort (1967), La La Land makes me feel like the world would be a much better place if people sang and danced at the drop of a hat (or stop of a car). But even with the almost cliche “romantic comedy” beginning, where La La Land differs from these films is the depth that it explores the relationships between two dreamers. While we always want our life partners to succeed in their dreams, it can be difficult to find a balance between somewhat contrasting goals. 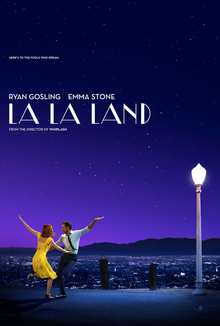 A must-see film for anyone who aspires to something greater in their life, I give La La Land 5.0 stars out of 5.